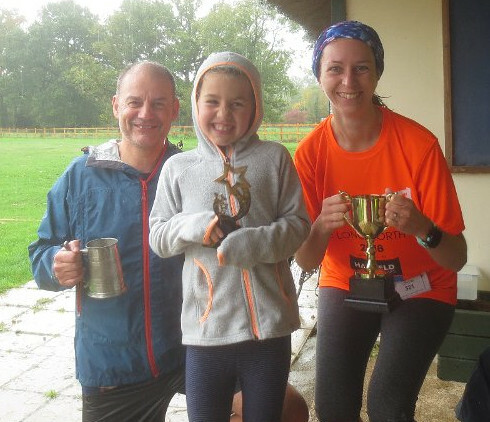 Storm Callum left the course under water in places but the wet weather did not deter 21 runners for the October race. We welcomed new runners Brendan Fletcher and Sophie Du Heaume and welcomed back the Strøiers from Denmark and Andy Smith's brother Rick. First home and our Rising Star was Elizabeth Brown. Rick Smith has clearly been practising in the 4 years since his last run at Longparish as he was our Most Improved Man with a new personal record. Claire Collier was our Most Improved Woman. Thanks very much to the adults who accompanied children round the course, to Mike Sleath, James Billingham, Ann Barker and Sarah Collier for marshalling, to Maggie Barber, Claire Collier and Jim Dundas for delicious refreshments, to Andy Smith for doing the signs, David Gould for crunching the numbers and to the Cricket Club for the lovely venue. Our next race is a week later than usual on the 3rd Sunday in November, which is the 18th, starting at the usual time of 10am at the Cricket Ground. Everyone is welcome especially volunteers to help (full training provided). If you'd like to run it is a handicap race so people of all abilities have a chance to win.